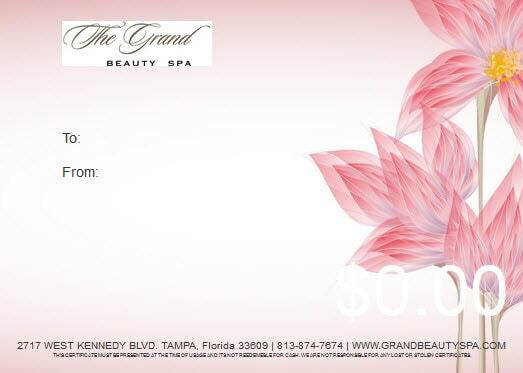 A Grand Beauty Spa eGift Card is the perfect gift for anyone. The gift of beauty and relaxation for your friends or loved ones gives them the permission to take time to spoil themselves. A massage, facial, or pedicure can do wonders for the soul. When you give the gift of beauty and pampering you give the gift of time for oneself. Let us take care of your list this year with a Grand Gift Certificate. Or, alternatively, call 813-874-7674 to purchase Gift Cards and one of our spa coordinators will assist you in choosing the perfect gift. Call 813-874-7674 to purchase Gift Cards and one of our spa coordinators will assist you in choosing the perfect gift.